Center Stage Atlanta, formally the EarthLink Live Music Complex, is an intimate 1,100-capacity venue where every seat is a winner. The venue has an undisputedly premier sound and lighting system, a cozy lounge area and a prime location in the heart of Midtown. Parking: Ample parking is available at reasonable rates in the neighborhood surrounding Center Stage Atlanta. MARTA: Take the Gold line to Arts Center Station. 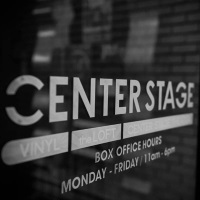 Center Stage Atlanta is a one-minute walk north from the station on West Peachtree Street.